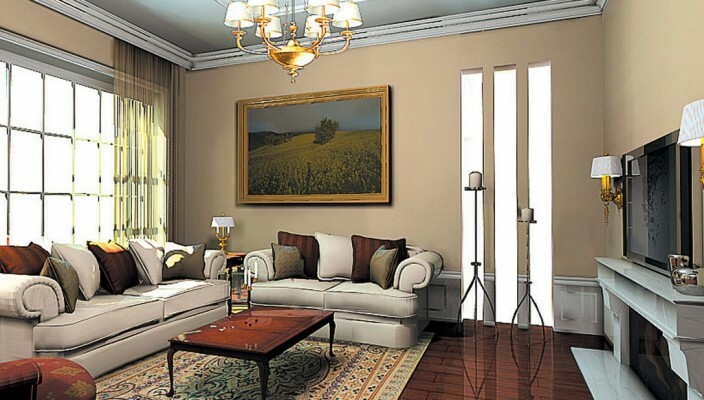 A perfect living room is like paradise for the inhabitants. Well designed and organized living room clear busy mind and provides peace as well as serenity. We help you to create perfect ambience for living room and more breathtaking view for the guests. This design is perfect for independent bungalows. King size sofa set covers more space and provides feel of room crowding. Television is placed opposite to sofa set on decorative wooden panel. A bay window offers fresh air and ventilation in the room. Window is provided with curtains. Traditional tea-poi is provided with sofa set. Steel stands are provided for candles. Small light lamps add richness to the room. Floor is provided with woodland setting, which provides natural look. Ceiling is provided with wood grain walls and classical lamp set. This will give royal touch to the room. This design is perfect combination of modern and traditional style. Guests will surely impress with this design.